Magpie Sports Awards | Nominations NOW closed. Raised in Lidcombe and currently residing in Croydon, Rick has followed the fortunes of the Western Suburbs Rugby League team (Wests Magpies) and witnessed the evolution of Wests Ashfield since his earliest days. He initially became a Football Club Official in 1981 and was appointed as the Magpies’ first full-time General Manager in 1983. 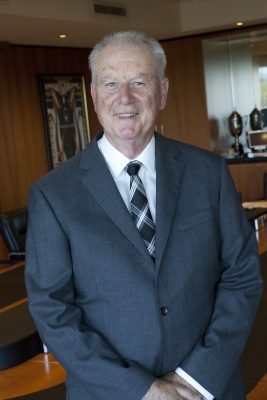 Subsequently, Rick has served on a variety of Wests Boards, initially elected as a Director of Wests Ashfield in 1984. Rick has been employed in a variety of other roles with sporting and business bodies, including being appointed as South Sydney Rugby League Club’s inaugural Marketing Director. Along with a long term involvement in broadcasting, including stints at several prominent Sydney radio stations, Rick also served as National Advertising Manager for Festival Records for eight years, until 1983. The continued development of Wests Ashfield as a first class amenity for its members and guests remains a priority for Rick. His Club activities include organising and compering, on occasion, Wests Ashfield Leagues fundraising initiatives for both the Wests Magpies (e.g. ‘Magpie Heritage Night’) and the Western Suburbs District Cricket Club, where Rick is currently Club Secretary. He is also a Director of Wests Tigers.